A-liya's dreams: We’re having a Blog Party!!! The Digital Arts Cafe Blog Party has begun! Woohoo!!! 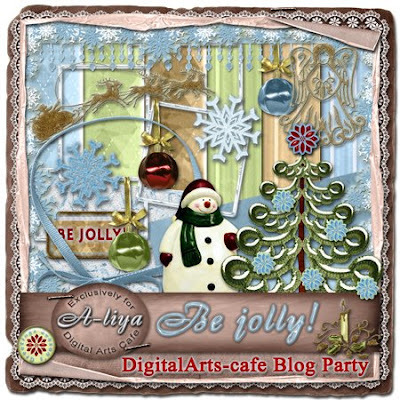 The following members will have a special DigitalArts-Cafe Blog Party freebie available for you to download from December 1st through December 7th. Don't forget to show these fabulous people some appreciation for volunteering these freebies to you by leaving some great comments on their blogs when you visit them! Check back each day of the Blog Party for a new treat from Melo! I love your part of the party. THanks! Thank you so much for A Beautiful kit!! Thanks so much for sharing. Blog parties are such fun and a wonderful opportunity to get to know new designers. Back to say TY so very much!!!!!!!!! Thanks a lot Aliya!as always, your creations are wonderful! lots of love! Thank you for a beautiful Christmas-Kit. Oh my! Love this kit! Look at Santa! and that tree! Thank you so much for sharing this delightful kit! Thank you for this beautiful kit!! Happy Holidays!! Such a 'happy' holiday kit! Thank you so much. Oh I just love the tree.. oh and the snowman... Well, I love this whole kit! Thank you so much for your generous gift! Just gorgeous, as usual:) Thanks so much for sharing! What a lovely kit!! Thanks so very much for sharing your beautiful designs! Thank you for being part of this blog train. It is so huge that I'm not sure about time to be creative. How addictive is this hobby? Thank you so much for your lovely Be Jolly kit. Love it! Cute snowman. Thank you for sharing your talent so freely. Doggone it, I missed it. Oh well! The snowman and tree are especially cute! And thanks for the other freebies you're offering, which I WAS able to get!